The SPCA and Pottsville Police are investigating a case of animal cruelty. According to Police Chief Richard Wojiechowsky, on Tuesday, July 2nd, 2018 around 2:00am, Pottsville Bureau of Police officers were investigating a domestic disturbance at 234 Wallace Street when they learned that a dog had been slammed into a concrete patio. 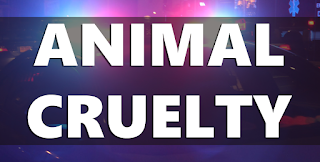 Further investigation led the officers to find the dog in the basement of the home and they observed that the dog’s left rear leg was limp and could not sustain any weight on it. In addition to the injured dog, officers also observed at least four other dogs in the residence along with a litter of puppies in the kitchen. Police say reported that the odor of urine and feces approaching the residence and inside the home was overwhelming. It was also learned that the animals in the house were not receiving any veterinary care and were not licensed. Due to the condition of the home and the dog’s injury, officers began attempts to contact representatives from the SPCA. Later that morning representatives from Hillside SPCA went to 234 Wallace Street with police and the dogs’ owner relinquished ownership of the injured dog along with the seven puppies and the mother to the SPCA. The investigation into the animal cruelty is continuing pending receipt of the official veterinary report following complete treatment for the injured animal.